Nowadays Twitter is being used as a mean of conveying the fastest information. This adds more when CubeSat XI-IV [sai four] developed by Intelligent Space Systems Laboratory (ISSL)-Nakasuka Laboratory at the University of Tokyo, Japan becomes the world's first satellite updating status on twitter. CubeSat XI-IV has been orbiting the Earth for 5 years and tweeting for about 10 days. CubeSat [http://twitter.com/XI_V] has over 2500 followers. CubeSat's tweets keep the followers updated about battery voltage, the temperature of the satellite, photos it has shot and all data. It has been sending some small images of Earth. CubeSat is 10x10x10 cm cube and weighs just 1killo has a CMOS Image sensor, know more about it. This is how the tiny CubeSat looks, Its developed by graduate high school students. 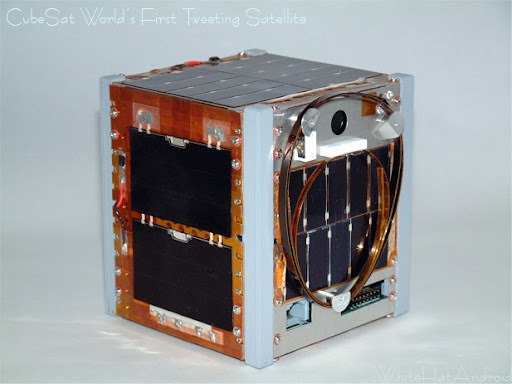 CubeSat XI-IV also orbits over India. There are several objects on Earth which have been tweeting and many more to come. Do you have any such device which is always online, that can tweet. This is probably the best information I have read on Twitter. Unknown but yet amazing. Thanks Shekhar for this. Many interesting stories have been there about tweeter. Such as astronots of NASA tweet from ISS, A man tweeted under water etc. Yes Shiva, Students do big projects there(many personal satellites), this is why they are advanced in the technology.